Call of Duty: Black Ops might be set during the world spanning staring competition that was the Cold War, but that doesn't mean you can't have a little fun with it. A video has surfaced that supposedly shows a secret level in Treyarch's Cold War shooter, Call of Duty: Black Ops. A word of warning however, this article will contain what could be some pretty hefty Black Ops spoilers, so if you want to be surprised, stop reading right here. The secret level appears after the credits have rolled on the single player game, starting with a secret meeting between set just after the Cuban Missile Crisis in 1962 between President John F. Kennedy, not-President-yet Richard Nixon - who Kennedy beat in the 1960 election - Secretary of Defense Robert McNamara and Cuban leader Fidel Castro. There's a certain degree of tension in the air, but that's quickly replaced with surprise as zombies break into the room. Fortunately, Kennedy keeps a secret stash of weapons for just such an occasion, and the four men tool up and get ready to go down fighting. 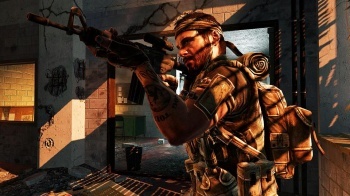 What follows is several minutes of Call of Duty zombie mode gameplay, with a single player - who is playing as Kennedy, naturally - surviving four waves of the walking dead before getting killed. It's funny, and silly and littered with pithy Kennedy quotes. There's always the chance it could have been faked, of course, but that seems rather unlikely, despite how bizarre the video is. Unfortunately, the video was plucked from YouTube following a copyright claim from Activision, so you can't watch it for yourself. Trust me on this one though, it was weird, but a lot of fun, and I rather hope that it appears in the final game. Call of Duty: Black Ops comes out for Xbox 360, Wii, PS3 and PC on November 9th.